And she, for whatever reason, spares his life." I normally do not read stories about ghost. 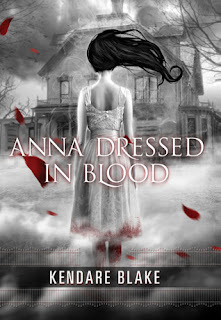 There was something about the title, Anna Dressed in Blood, that drew me in. I pleasantly and creepily surprised by the quality of this ghost story. There were so many points when I thought in my head, holy crap did that just happen. I usually read late after the kids go to sleep and I found myself hearing every little noise in my house. Kendare Blake's writing sent chills down my spine at points but I couldn't stop reading it. I was so captivated by the characters and what their stories were. I was surprised for some reason every time someone was murdered. It was a creepy roller coaster ride with a lot of twist and turns and things you don't seem coming. I really liked the characters in this book. Cas, the professional ghost killer, was easy to like. Even though he's shut himself off to the world with a no friends policy. You can see his tenderness in the way he treats his mom and his dedication to finishing what his dad started. Anna, the rampaging murderous ghost, was easy to feel sorry for. Even while she was murdering people before you knew what made her the way she is. Cas's white witch mom, black witch friend and the prom queen made a fun cast of supporting characters. I liked that the prom queen wasn't some mean dim-witted girl like you would expect. I connected to the characters easily. In general I loved the story and I loved how it was written. It had me by locked in but I felt the end was a little rushed. They introduce a sort of new character and it seems like Kendare kind of speed through his role. I'm wondering if he will make a reappearance in the next book but we will see. It's the only reason I would give this 4.5 stars instead of 5. Even if you don't like ghost stories usually I would read this book.